In order to receive your certificate, please make sure that your certification forum posts comply with the following check list. ===> Complete your forum profile. Use your actual first and last name. This needs to be the same name as in your certification registration so that we can match up our records. Your forum display name has to be your actual name, not something totally unrelated like “yogibear37”. Use the same name, your real first and last name, for certification registration, forum profile display name, and topic title! 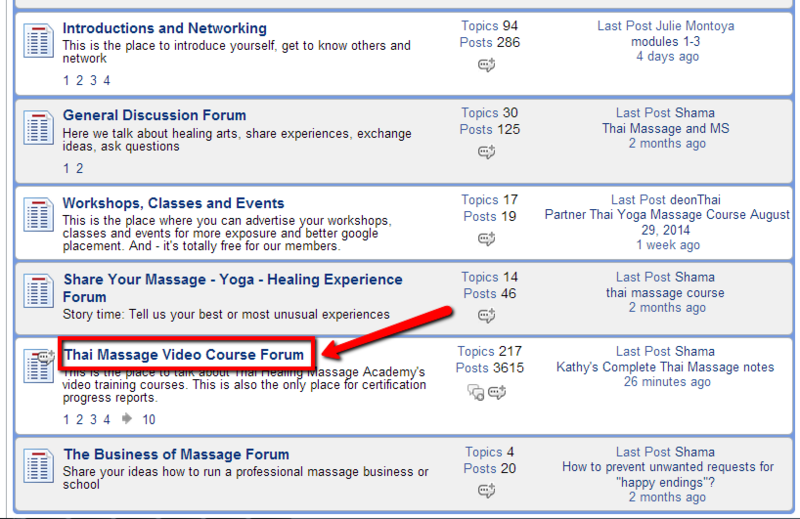 Your certification forum posts need to be in the Thai Massage Video Course forum, not in any other forum. The topic title has to include your first and last name AND the name of the course which you are taking. Each course module has to be addressed individually. Modules cannot be combined. There needs to be one post for each course module. You need to write several sentences. One sentence is not enough. Do NOT only list the content of the module. Instead write about your experience with it, your practice, feedback from practice partners, how people react to Thai Massage where you live, what kinds of problems you are trying to help people with, or ask questions, if you have any. First, only listing the content of a video does not show that you are working with the material. And second, it is dry and boring to read! All your forum posts have to be under the same topic. Do not start a new “topic” for every post. Only “Reply” to each post. In this way all your posts will stay together and can be found easily. Here is an example how a correct certification forum post should look like. This post is just long enough to be acceptable, and it includes the student’s experience with the module and her partner’s feedback. You can write a longer post, but the post below is the minimum standard. This makes it obvious that the student is actually practicing the material, and that’s what the certification forum posting is meant to demonstrate.